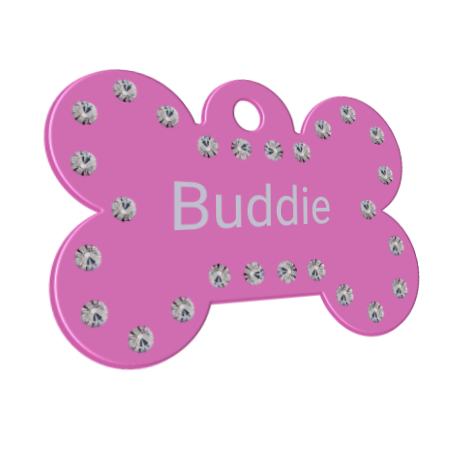 These Pink anodised aluminium bone-shape pet tags with 26 sparkling clear diamantes are very hard wearing. They are very stylish, and like all anodised aluminium tags, they are exceptionally durable. This is a Pink tag with clear crystal diamantes. The tags measure 38mm wide and 29mm high. Engraving is free, and each tag is supplied with a plated nickel split ring. and on the reverse with up to four lines of text. These tags are also deep engraved with your contact details.